This entry was posted on July 20, 2012 at 8:00 pm and is filed under Action, Crime, Drama, Superhero with tags 2012. You can follow any responses to this entry through the RSS 2.0 feed. You can leave a response, or trackback from your own site. With regards to the Bane audio issues, I have a suspicion as to what the problem is – I believe that most people who will be having problems understanding the character’s dialogue at times will be in cinemas where the bass speaker is not properly turned up enough. Both times we saw the movie his dialogue was clear and easy to understand, but the first time we were in the back row, and the second time we were 3rd row from the front (after coming out the first time the queue was already horrendously long!). The second time it was more noticeable, that Bane’s voice carries a particularly powerful resonance, most of which is pumped through the bass/subwoofer, that’s part of what makes him such a presence on screen, and I believe that these cinemas that don’t regularly calibrate their sound systems are in need of a tune up. See this in Imax if possible, roughly about half the shots in the movie have been shot in Imax, and it looks glorious up there on the screen. Oh I didn’t mention it in my review but I did see the film in IMAX. I wanted to focus more on the film itself and not my film going experience. But yes it was incredible. I highly recommend it in that format. The sound was very loud and Bane’s voice was very electronic. At times the words just weren’t clear as if the sound person had overly mixed the vocals to sound other worldly. I don’t think it had anything to do with the sound system as it was one of the best. Thanks for your comments. You seem like a big fan of the series. I was waiting for this review of yours with bated breath. So glad it’s finally here!! Can’t believe TDKR’s finally here, for that matter… 😦 I wonder who’s going to direct the next interpretation, because another one is INEVITABLE. I hope someone great like Christopher Nolan. If we get another Joel Schumacher directing a Batman movie, I’ll FLIP. Great review. 😀 I’ll have to wait a few weeks for this one. One, because the theaters are so jam-packed (though maybe not as much as they would be if that nimrod hadn’t shot 72 people who went to see it), and two, because I’m planning on going with a friend–he’s memorized just about every line Heath Ledger said in The Dark Knight–and him and I are not available simultaneously until at least, like, the 3rd, 4th, or 5th of August. I’m so excited. Surprised to find out the new turn Nolan took on the “Catwoman”. I’m glad Anne Hathaway isn’t Halle Berry bad in her role, but I’m kind of sad that she isn’t quite as great as Michelle Pfeiffer. I loved her in Batman Returns. I’m sure you’ll love this. Best superhero film of the year. It is very dark so it’s not particularly fun like The Avengers, but it is an exhilarating story. Many times I’m disappointed by the conclusion. This had a satisfying ending. I need to watch this. This week will be the longest of my life. Fantastic review, as always. I feel you. Be thankful you don’t live in Italy where they’ll have to wait until August 29th to see the film. Now that’s just inhuman! Oh, that IS awful. Poor Italians 😦 Only 4 days to go for me! Great review Mark, I just got done viewing this movie for the second time in two days and I can tell you that it does hold up very well for a second viewing. I actually felt like I understood a lot of points quite a bit better the second time around, especially Bane’s motivations and the political aspects of the film. Anyways if you’re interested I’m going to be posting a series of reviews digging in to each major character or set of characters as well as a few other aspects of the film, so I’d love to hear from someone like you in a more Spoiler filled forum. Cheers! I saw the film on opening day and I already feel like I’m falling behind. You’re like the 10th person to tell me you’ve seen the film TWICE already! Anyway, I look forward to your reviews. Hi Mark – thanks for dropping by my blog and for your comments on my review. Like you, I feel a bit like I’m lagging as I only saw it on opening night and two days have gone by since, without a second viewing. I’ll rectify this situation tomorrow. I loved the concluding paragraph of your analysis…totally agree about the emotional connection and the ‘rising’ of the underdog. Great TDKR analysis. Good opening. No spoilers. Excellent! 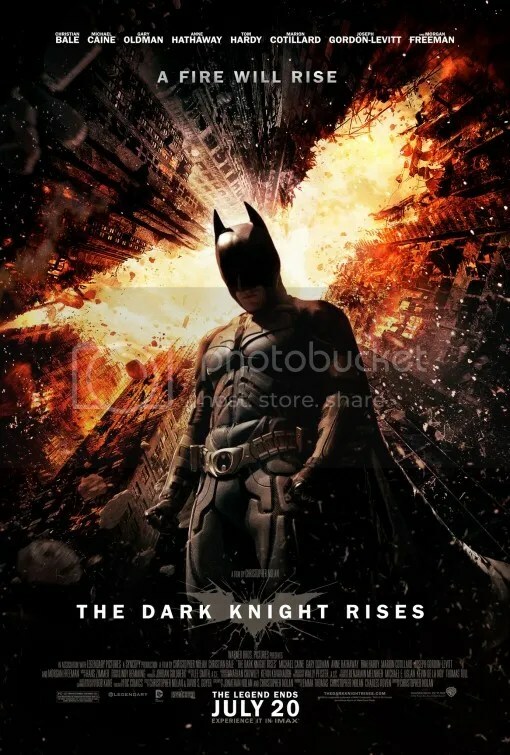 The Dark Knight Rises is an awesome movie. Batman and Gordon in ending scene is best movie quote ever. A brilliant right up Mark. I’m glad you gave it the thumbs up for IMAX I would of been disappointed seeing as The Dark Knight was superb in that format. I think me and Amy will have to go and see it again in the near future. I don’t know if it’s because we saw a special Batman Begins/The Dark Knight screening this week but my anticipation for this film was through the roof, I would go as far to say this is my favourite trilogy ever. I can appreciate why you’d call it your favorite trilogy ever. The original Star Wars trilogy is mine, but this is definitely up there for me as well. So I see you were a guest on Aaron Neuwirth’s podcast about the film? 😉 Congrats, Mark! I finally saw this!!!! Stay tuned! The movie is superb! I particularly like The Dark Knight costumes. Wish I had those abs. Haha. Aw…….the magic of Imax ! Such an awesome and visually stunning film. I think they succeeded on a satisfying ending to this trilogy. I saw it twice and loved it even more the second time. 3D is a cash grab, but IMAX is a valid format. This is the proof. Enjoyed it a second time as well. This is by far the greatest trilogy I’ve ever seen! You know a trilogy is great when you can watch any of the 3 films and have a hard time deliberating which installment was the best. Ultimately, I would select “Dark Knight” as the best, mostly b/c of Heath’s immaculate performance, but there were moments in the other 2 that warrants consideration. Another thing so great about this trilogy is how perfect the closing scenes of each film are; they leave you wanting more. Batman taking the Joker card in part 1; Batman riding off and evading the police with cape blowing; John Blake discovering the Batcave. A bad ending can really taint a film, and Nolan paid great attention to every detail from beginning to end in each film. Glad to see you like this trilogy as much as I did. Except I think I liked Batman Begins more than you as I would rate it higher than 3 and a 1/2 stars. I’d give it a 4 1/2 or 5. But I didn’t love it the first time I watched it. It was a couple years later I grew to love it after watching “Dark Knight”. Not sure when the last time you’ve seen it, but if you haven’t watched it since the series concluded, give it another viewing and I think you’ll appreciate it in a different way, just as I now do.